Looking for something to do this April vacation? 4/17: Watch the Baseball Beanpot at Fenway! 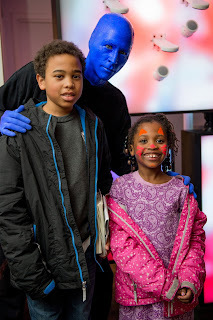 From April 15-17, prepare to enter the Blue Man Group tribe when the theater staff offers glow-in-the-dark face painting in the Charles Playhouse Lounge before the show. Kids and adults can pick out tribal-inspired designs and glow during the performance! All activities are free for ticketholders. Children under the age of 3 are not permitted in the theatre. The college baseball doubleheader will feature teams from Boston College, Harvard University, Northeastern University, and the University of Massachusetts at Amherst. Tickets are general admission and priced at $10 each. Net proceeds will benefit the Pete Frates #3 Fund, named after the former Division 1 college athlete who was Captain of the Boston College Baseball team and diagnosed with Amyotrophic Lateral Sclerosis (ALS), also known as Lou Gehrig’s disease. On Friday April 19th and Saturday, April 20th, Primark Downtown Crossing will host the Iron Throne from HBO®’s mega-hit series, Game of Thrones. Friday, April 19th, 9:00 a.m. Fans are encouraged to don their best Game of Thrones garb and be ready to snap and share pics with the Throne just as the store opens. The first 50 who arrive on the 19th in costume and get a picture with the throne will win Game of Thrones collectibles. See store for details. Saturday, April 20th, 12:00 – 4:00 p.m. Fans can capture themselves with the Throne in a dynamic, shareable format using Primark's GifGif booth. We will have props from their collection to add to the fun! Lastly, Primark will be running a social media competition on April 19th and 20th. Fans who share a static post (not just a story) with a picture of them in the throne using the official #PrimarkGoTSweeps and #PrimarkUSA tags will be entered into a competition with the chance to win Primark’s GoT season premiere survival kit. Entrants must be 17 years or older and need to follow @primark.usa to qualify. One winner will be notified on Monday, April 22nd. No purchase necessary. See store for full terms. 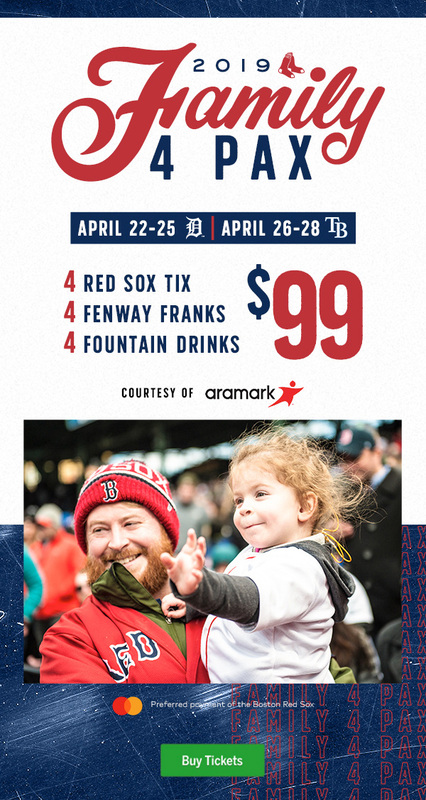 Score 4 Red Sox Tickets, 4 Fenway Franks and 4 Fountain drinks for $99. To purchase tickets please visit www.mlb.com/redsox/tickets/packs/family-4-pax. NOTE: We are providing this information for our readers! As with all of our Red Sox posts, we are providing this information as we are Red Sox Parents. No compensation was provided in exchange for this post and our opinions, as always, are our own. 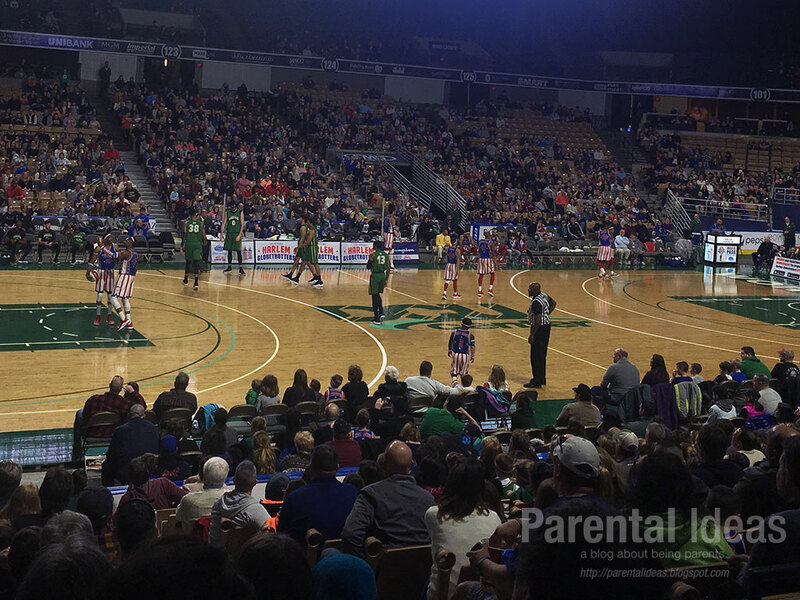 I recently had the opportunity to bring my daughter and her friend to see the Harlem Globetrotters at the DCU Center in Worcester. This year the Globies are on their Fan Powered tour taking their fun times and hilarious antics to the next generation. 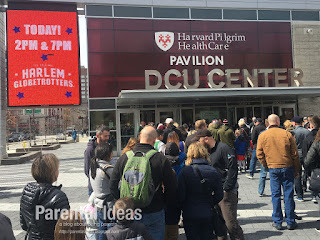 I was my first time going to the DCU Center and we parked in a nearby garage. We walked to the door and found a line had formed outside as you have your ticket scanned immediately on walking through the doors. 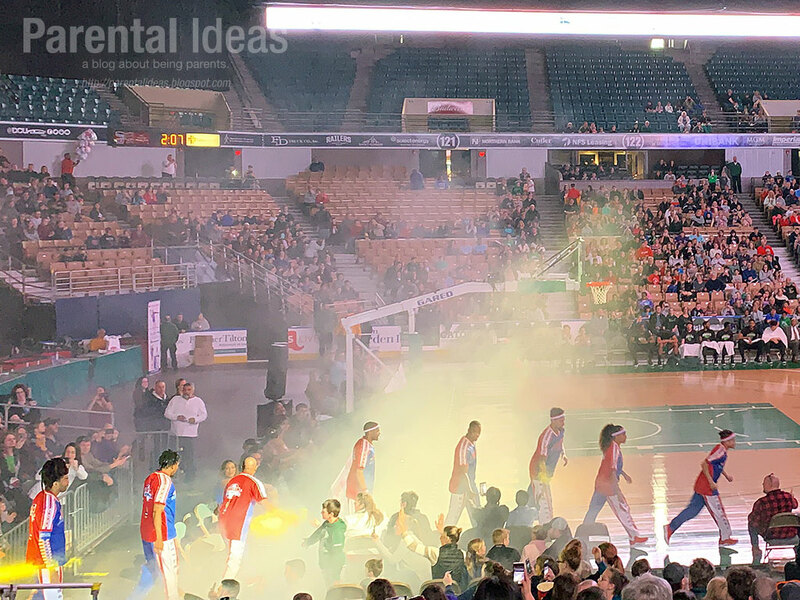 We found our seats just before the teams were announced and then the fun antics began with team introductions and Globie, the mascot entertaining the crowd. 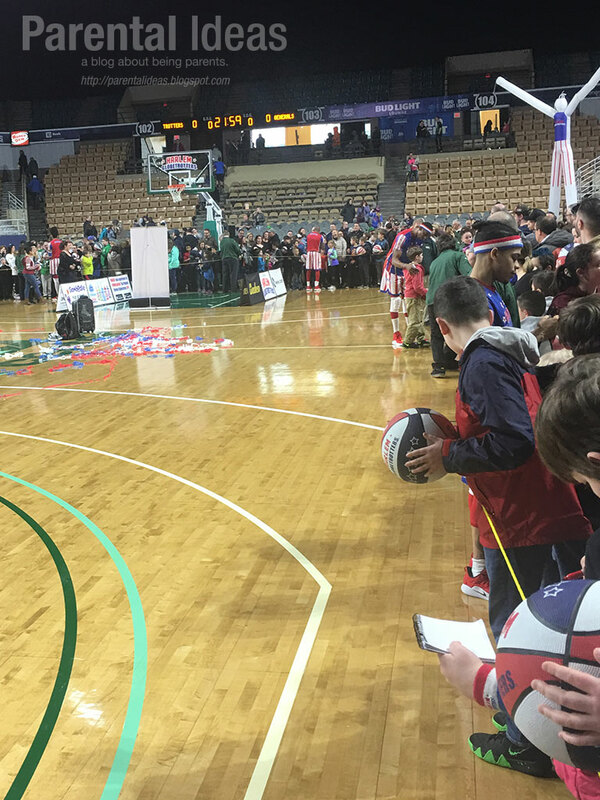 Be sure to plan on staying after the game - you can go down to the court level and go around and meet the players, get their autograph and take photos with them. Such a cool experience. 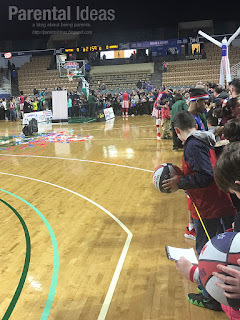 If you go to meet the team, just be aware that the players generally don't move, you need to walk around to meet them and get their autograph. The next game in our area will be this weekend in Providence, RI on April 6 with two shows, one at 2 pm and one at 7 pm. 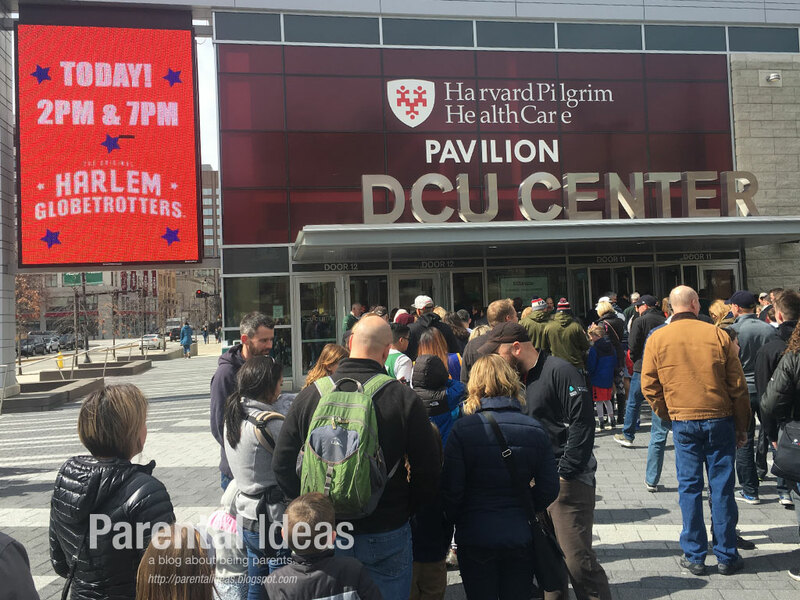 The line outside of the DCU center went somewhat quickly, but be prepared to wait outside. The view from our seats was great. There were so many hilarious antics during the game, like this one - one of the players hopped up on the top of the hoop during the game. So fun! At the end of the game, you can go down to the court. to meet the players, get autographs and take pictures. Just be aware that you need to move around to meet each player - they don't come to you. 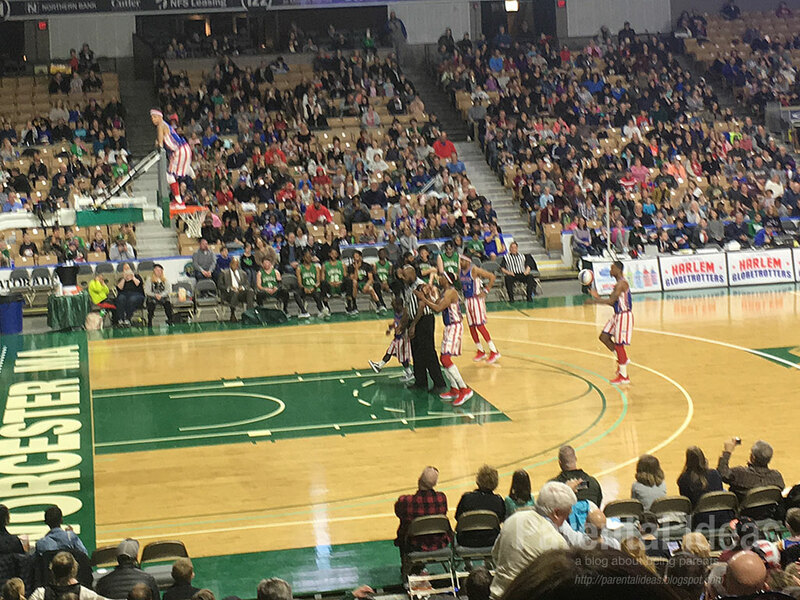 NOTE: We were provided with tickets to the game to facilitate this review. No other compensation was provided. As always, all opinions are our own. I've really been taking some time over the past month to slow down, enjoy the moment and cherish time with my family. 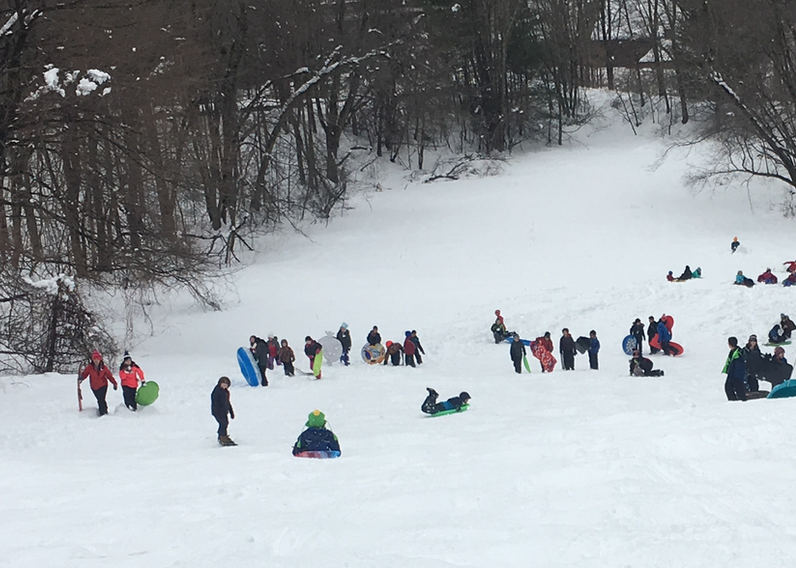 I love being able to partake in fun activities with the kids, friends and family and as it's starting to warm up, we are spending more time outside. 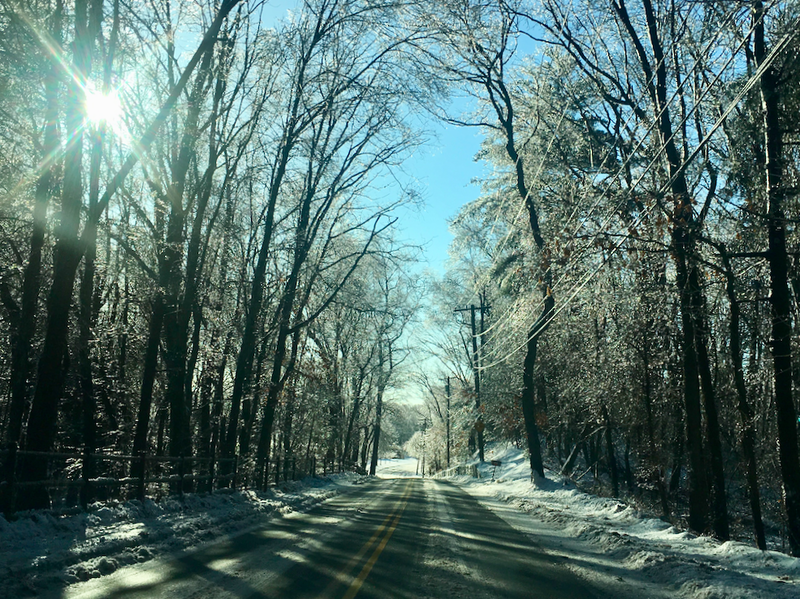 Recently, we had some late snowfall (in March!) in a quick burst. 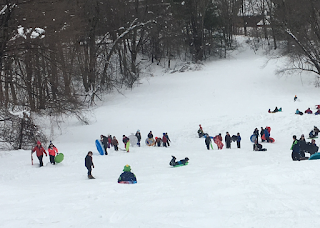 I had a chance to take a quick break and go sledding - something I haven't done for at least 20 years. It was so much fun and we were laughing all of the way! I think spending time outside and slowing down, and being present, is so important. There's truly nothing like listening to laughter, having fun, and playing outside. NOTE: This is a sponsored post from Comcast about xFi. I had been using my own modem for a few years and it's been a good experience, especially when you're trying to save a few bucks off of the monthly bill. 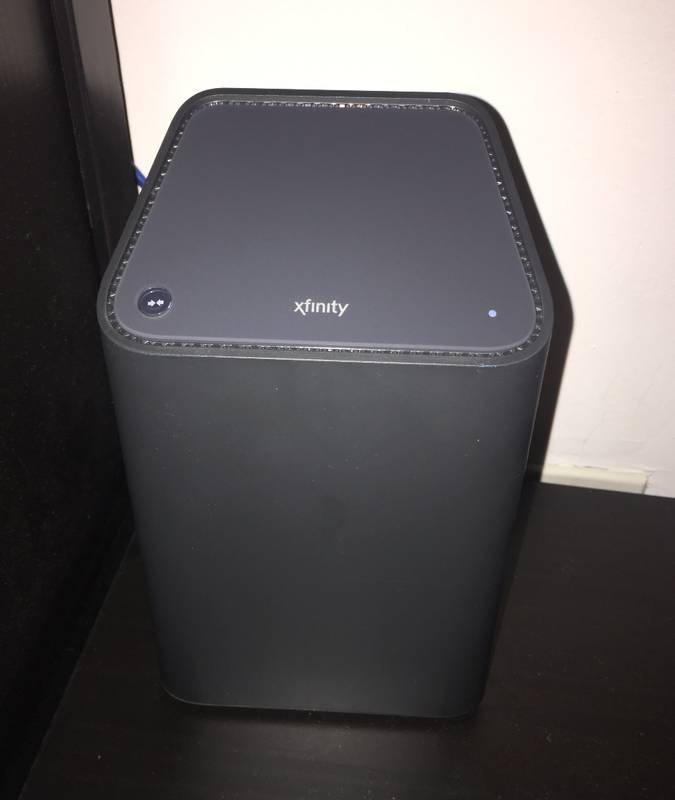 I quickly noticed some tradeoffs, most notably not getting the full benefit of increased network speeds since Comcast's technology is always evolving, which quickly made my purchase dated technology. I've recently changed to renting the modem, which gives a few advantages: when Comcast makes any improvements, I can just swap the modem. They have also included quite possibly, one of the best new features at no additional charge - xFi, which is only available if you're using their latest rented, in-home gateway. xFi gives you greater control through a simple, modern, easy-to-use experience so that you can choose who can access your network at any time. You can download the enhanced xFi experience through your mobile device app store, available for iOS or Android, which enables you to see what devices are on your home WiFi networks, troubleshoot issues, and even pause your home WiFi connections during those times you want people to be focused on things other than the internet and screens. One great feature is that you can assign a time allowance per device (think different lengths of time per iPad) so you can ensure your kids aren't spending too much time watching videos on Youtube. Pause with a Tap: using the xFi app you can pause the network access by time, device or even user. Check out xfinity.com for more information! 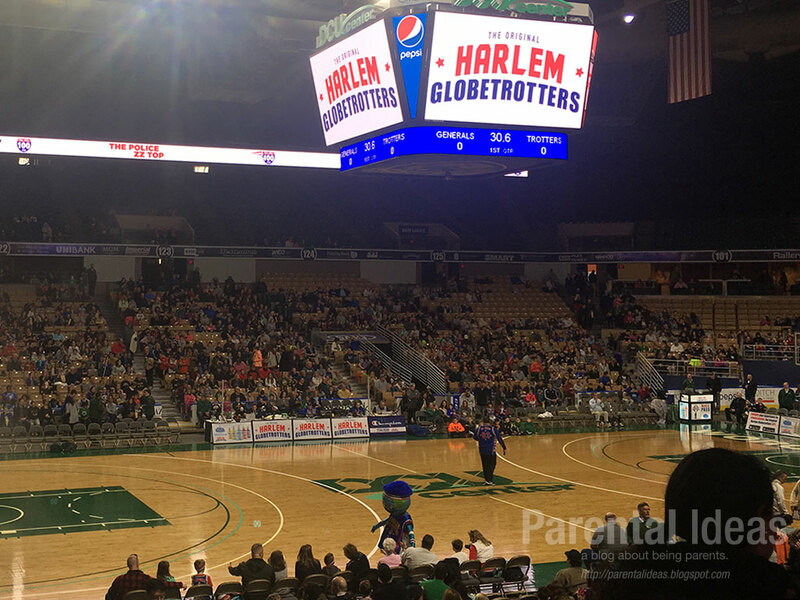 The Original Harlem Globetrotters are coming to Worcester on March 23rd brining their all new fan-powered world tour to town! The Globetrotters are known for their amazing feats of basketball, humor, and acts of goodwill on and off the court. And they have always been about the fans, but this year, everything they do will bring fans closer to the action more than ever before. Join them as they celebrate fans during the all-new Fan Powered World Tour! 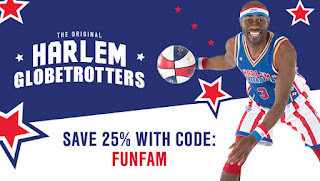 There will be over 20 occasions before, during and after the game where you have the opportunity to directly interact with Globetrotters stars. THIS IS A SPONSORED POST: I was compensated for this post. As always, all opinions are my own. Recently, I attended an evening at the Revere Hotel hosted by Xfinity to announce their partnership with Amazon Prime Video. It was a wonderful evening, complete with a candy bar, a performance by a local Lindy hop group before watching the season two premiere of the Marvelous Mrs. Maisel on a large movie theatre style screen. X1 customers can now easily search Prime Video programming, by easily pressing the voice button on your remote and say "Amazon Prime Video". You can enjoy exclusive Prime Originals including Homecoming with Julia Roberts, Tom Clancy’s Jack Ryan, The Marvelous Mrs. Maisel, and more. Stream – The Xfinity Stream app makes cloud DVR and live-in home streaming on mobile devices possible for X1 customers. Xfinity My Account – helps customers manage their Xfinity services. For example, you can schedule a callback from a Comcast representative, set up service appointments, troubleshoot devices, change your Comcast account password, and adjust your WiFi settings in one tap.